Review the undergraduate college requirements below prior to applying to the College of Sciences. To be admitted to an undergraduate program in the College of Sciences, you can apply to UNLV and the College of Sciences simultaneously or you can transfer from another major or be undeclared. The undergraduate application is online — simply follow the steps on the university’s admissions page. You’ll find information for freshmen, transfer students, and international students. Review the graduate program requirements below prior to applying to a graduate program. You must first apply for admission to the UNLV Graduate College by completing an online application found on the Graduate College webpage. Admission requirements are different for each of the post-graduate degrees offered through the College of Sciences. Admission Policies: Prospective majors with GPAs less than 2.50, but at least 2.30 may be admitted on probationary status. Students who enter on probation must meet with an adviser to establish a probationary course of study. Specific details pertaining to probationary status can be found in the College of Sciences listing of the undergraduate catalog. Transfer Policies: Transfer students must have a minimum GPA of 2.50. All students are required to meet with an adviser to determine course work that can be used to satisfy degree requirements. The last 30 credit hours must be taken at UNLV. Although rare, it is possible for superior pre-professional students to gain admission to a professional school upon completion of 94 units of undergraduate work. Such students may, under certain circumstances, be awarded a bachelor's degree from UNLV upon successfully completing one year of full-time study with courses equivalent to the Department of Biological Sciences major at the professional school. To apply for a degree after one year of professional school, students must have completed 94 units at UNLV with a GPA of 3.5 and meet university and college graduation requirements. Students contemplating such a program must obtain approval from the departmental chair and college dean in advance of their departure from UNLV. Community College Articulation: The department of biological sciences has course articulation agreements with several community colleges both within and outside Nevada. For specific information about transfer of credits from two-year institutions, students should seek advising about specific courses of study from the department. Academic Policies: In addition to the general education core requirements, all study courses must include a minimum of 39 credits in the biological sciences and satisfy the specific requirements of one of the five concentration areas offered by the department. In accord with UNLV requirements, at least 40 credits must be earned in upper-division level courses. This requirement may be satisfied by selecting courses within and outside the Department of Biological Sciences. To graduate with a degree in the biological sciences, a GPA of at least 2.00 must be maintained for all courses in the major field (BIO). All BIO core courses taken (BIO 189, 196, 197, 300, and 415) must be passed with a grade of C- or better to fulfill prerequisites for other upper-division courses or to apply toward the Bachelor of Science degree in the biological sciences. Admission Policies: Students must meet minimum GPA requirements. Probationary admission is provided for those students with a GPA between 2.30 and 2.49. See the departmental policies and College of Sciences sections for further details. Transfer Policies: Transfer students should first have their transcripts evaluated by student enrollment services, then schedule a meeting with the College of Sciences advising center. Based on the transcripts and catalog descriptions, equivalencies to UNLV courses will be determined and a plan for completion of the degree will be developed. In cases of questions regarding the transferability of a particular course, satisfactory performance (i.e., a grade of C or better) by a student in a higher numbered UNLV chemistry course for which the proposed UNLV transfer course is a prerequisite shall be accepted as proof that the student has mastery of the course content and the student shall be awarded transfer credit. Academic Policies: Majors may count no more than one grade of D in chemistry courses toward meeting degree requirements. Chemistry courses taken more than eight years prior to the proposed date of graduation are subject to review by the department, and at the discretion of the department, such courses may not be allowed for application to a degree program. Students potentially affected by this policy should meet with the department chair. Minors: No grade lower than a C (i.e., C- and below) may be applied to a chemistry minor. Credit toward the minor will not be allowed for both CHEM 220 and CHEM 241. Non-chemistry Majors: Non-chemistry majors who seek rigorous preparation in chemistry for medical school, graduate school in other fields, or research positions should consider the sequence CHEM 121, 122, 241, 241L, 242, 242L, and possibly CHEM 421 and 474-475. Transfer Policies: All transfer students should meet with an adviser without delay after admission in order to evaluate the applicability of previous course work to UNLV major and graduation requirements. Graduation Requirements: For graduation with a major or minor in geology, a minimum final grade of C (2.00) is necessary in all required geology courses. In addition, before enrolling in any geology course, the student must have completed each geology prerequisite for that course with a grade of C or higher. Admission Policies: The department follows the admission policies of the College of Sciences. Advisement: Each student is assigned a faculty adviser and is required to see the adviser at least once a year. Degree Requirements: A grade of C or higher is required in each MATH or STAT course used to satisfy degree requirements for a major in mathematical sciences. At most, six credits of independent study may be used in any undergraduate degree program in mathematical sciences. Admission Policies: Students unable to meet the 2.50 GPA requirement may be admitted under contract on a probationary basis and no students with GPAs less than 2.30 will be admitted. Transfer Policies: A student transferring from another college or university who declares a major in physics, applied physics, or computational physics with a GPA between 2.30 and 2.50 may become a probationary student. A probationary student must plan a prescribed course of study in physics in consultation with the faculty adviser assigned by the physics department. Only after the course of study is signed by the adviser may the department chair allow the student to register for courses. The student must maintain a GPA of at least 2.50 in the courses taken while on probation. Otherwise, the student will be dropped from the physics program. When the student's overall GPA rises to 2.50, the student is taken off probation. Refer to the College of Sciences section for further requirements. Academic Policies: For all majors in the programs offered by the department of physics, a grade of C or higher is required in each of the physics core. Specific degree requirements, including those listed below, are described in detail in the Biology Graduate Student Handbook (available from the graduate coordinator, biological sciences). Complete a minimum of 30 credit hours beyond the undergraduate degree. At least 18 of these hours must be completed at the 700-level. Students may request a maximum of 15 graduate credits taken at UNLV prior to admission into SoLS's Graduate Program to be counted towards the 30 credit hour minimum graduation requirement, provided that those credits were not used to fulfill undergraduate requirements and that a minimum grade of "B" (3.00) was earned in each course. At least 50 percent of the total credits required to complete the Master's degree must be earned at UNLV after admission into the Graduate Program. Students should register for at least nine (9) credits each semester if they are receiving financial support from SoLS; otherwise they must register for at least six (6) credits each semester. Students working on their thesis must register for at least three (3) credits each semester (excluding summer) until the Master's Thesis is completed and given final approval. Students must confer with their Thesis Advisor prior to enrollment in their first semester. The Advisor will assist with designing an initial graduate degree program (i.e., an outline of the courses that the student will complete for the degree), engage in discussions about possible research directions, and introduce the student to the personnel and resources of the School of Life Sciences. Students must form an Advisory Committee before the department's posted deadline. This Committee will be composed by the Thesis Advisor (who will serve as the Committee Chair), two members of SoLS's Graduate Faculty, and a Graduate Faculty Representative from UNLV (but outside of SoLS). An additional committee member may be added at the student and department's discretion. Please see Graduate College policy for committee appointment guidelines. Students must meet with their Advisory Committee at least once every year (i.e., from January to October), and a written report of this meeting must be submitted to SoLS's Graduate Operations Committee by November 1. The Advisory Committee will review the student's past academic background and, taking into consideration the student's research interests, determine his/her definitive graduate degree program. Students must comply with the deadlines indicated in SoLS's Graduate Student Handbook for submitting required paperwork to the Graduate College. A student will be placed on academic probation if a minimum 3.00 grade point average is not maintained in all work taken as part of the graduate degree program. A grade of "C+" or less in two graduate-level classes will cause a student to be placed on academic probation. The M.S. candidate will present a seminar on his/her thesis work that is open to all interested parties, including the general public. This public seminar will be widely advertised at least seven (7) days before it takes place, and will be followed by an oral defense of the thesis research before the Advisory Committee and any other Graduate Faculty member who wishes to attend. Students are expected to complete all the requirements for the Master's degree in 2-3 years. Complete a minimum of 60 credit hours beyond the undergraduate degree. At least 24 of these hours (excluding dissertation) must be completed at the 700-level. Dissertation credits may be repeated for credit as needed, but only 12 credits may be counted towards the 60 credit hour minimum graduation requirement. Students must complete the specific didactic course work required. See SoLS's Graduate Student Handbook for specific requirements. Students should register for at least 9 credits each semester if they are receiving financial support from the School; otherwise they must register for at least 6 credits each semester. Students working on their dissertation must register for at least 3 credits each semester (excluding summer) until the Dissertation is completed and given final approval. Students must confer with their Dissertation Advisor prior to enrollment in their first semester. The Advisor will assist with designing an initial graduate degree program (i.e., an outline of the courses that the student will complete for the degree), engage in discussions about possible research directions, and introduce the student to the personnel and resources of the School of Life Sciences. The student must form an Advisory Committee before the department's posted deadline. This Committee will be composed by the Dissertation Advisor (who will serve as the Committee Chair), two members of SoLS's Graduate Faculty, and a Graduate Faculty Representative from UNLV (outside of SoLS). Students are encouraged to include a fifth Committee member who is an expert on the student's field of research. 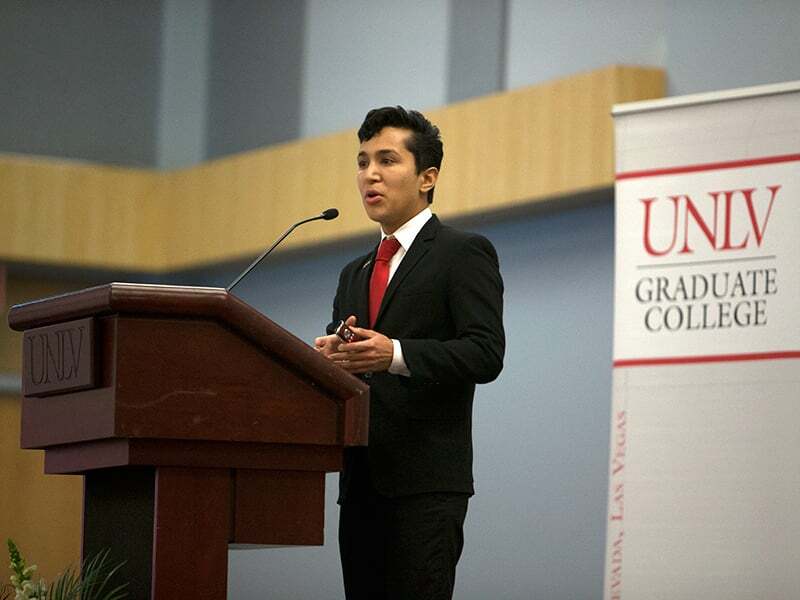 This fifth Committee member can have an academic affiliation outside of UNLV. See SoLS's Graduate Student Handbook for specific requirements. Please see Graduate College policy for committee appointment guidelines. Students must take the comprehensive examination before the beginning of their sixth semester of residency in the Graduate Program. The exam must be held at least three (3) weeks before the last day of instruction of any given term. The exam will include both a written and an oral component, and will assess whether the student has reached the appropriate level of knowledge and analytical skills necessary for his/her field of study. The examination is developed or administered by the Doctoral Advisory Committee or an ad hoc Committee composed of Graduate Faculty within the Section to which the student belongs. See SoLS's Graduate Student Handbook for information on the possible outcomes of the exam. Students who fail to pass the exam within the specified timeline will be placed on academic probation and will be allowed one retake of the exam. Failure to pass the retake or meet the requirements of academic probation will result in separation. Doctoral students are advanced to candidacy after passing their comprehensive examination. Specific curricular requirements for each SoLS Section are described in detail in SoLS's Graduate Student Handbook. Each doctoral student should teach for a minimum of two semesters in the undergraduate curriculum of the School of Life Sciences. During that time the student will receive a Graduate Teaching Assistantship. A student will be placed on academic probation if a minimum 3.00 grade point average is not maintained in all work taken as part of the graduate degree program. A grade of "C+" or less in two graduate-level classes will cause a student to be placed on academic probation. Failure to meet the requirements of academic probation will result in separation. The Ph.D. candidate will present a seminar on his/her dissertation work that is open to all interested parties, including the general public. This public seminar will be widely advertised at least seven (7) days before it takes place, and will be followed by an oral defense of the dissertation research before the Advisory Committee and any other Graduate Faculty member who wishes to attend. Statistics: Each doctoral student will complete at least one year (a minimum of six credits) of upper-division undergraduate or graduate course work in statistics appropriate to the natural sciences. Instructional: Each doctoral student will spend at least the equivalent of one academic year as a teaching assistant in the undergraduate curriculum. Other: Requirements for additional skills in foreign languages, computer programming, advanced mathematics, or advanced statistics will be determined by each student's Doctoral Advising Committee. The graduate college requires two years of full-time residency on the campuses of the university and community college system of Nevada. At least one continuous academic year (and usually the final year) of residence must be at the UNLV. An undergraduate degree in chemistry, chemical engineering, or a related discipline. A cumulative GPA of 2.75, or of 3.00 for the last two years of undergraduate work. A Graduate College application accompanied by official transcripts of all college-level work. Two letters of recommendation from individuals able to assess the applicant's potential as a graduate student should be sent directly to the department along with an additional set of transcripts. The GRE General Aptitude Test results received by the Graduate College prior to regular admission. A minimum of 30 graduate credits is required, of which 10-13 must be in CHE 795 and CHE 798 and two in CHE 791. At least 12 of the remaining credits must be in courses at the 700-level, excluding those course numbers listed above. GPA of at least 3.00 must be achieved in all course work required for the degree. No grade lower than C is acceptable, and only one grade below B- is permitted. Research and course work specializations are available in analytical chemistry, biochemistry, organic chemistry, and physical chemistry. The individual student's program of course work must be selected in consultation with and approved by the student's committee, and may include courses from selected disciplines other than chemistry, such as biology, physics, civil and environmental engineering, or water resources management. Students are expected to select a research adviser by the end of their first semester. Each student is required to present a departmental seminar on the student's research prior to graduation. This requirement is in addition to the two credits in CHE 791. Students are expected to attend weekly departmental seminars. Each student is required to meet at least once per semester with the student's examination committee. At the meeting in the semester prior to the expected term of graduation, the student will be asked to make a detailed presentation on research progress. The committee will then make recommendations to be addressed by the student during the remainder of the student's research program, in writing the thesis, and in the final examination. The committee may request another meeting prior to the final exam if deemed necessary. It is expected that each student will be a teaching assistant for a minimum of two courses prior to graduation. It is also expected that each student publish at least one research-based manuscript in a peer-reviewed journal. Individuals with apparent deficiencies in their undergraduate background may be required to enroll in selected courses in addition to those listed below to satisfy the master's degree requirements. We admit students during both fall and spring semesters. The official deadline for submitting application materials for Fall admission is Feb. 1; for Spring admission the deadline is Oct. 1st. However, please send materials early - admission decisions are made shortly after the deadline dates and an application that is missing a component will most likely be rejected. A bachelor's or M.S. degree in geoscience or an appropriate related field. A minimum overall grade point average of 3.00. In rare cases students with a GPA less than 3.00 may be admitted. Satisfactory scores on the General Graduate Record Examination (GRE). Minimum Verbal GRE scores are 400, and minimal Quantitative scores are 500. A completed application and fee. Once you complete the VIP log in, create your profile and submit it. Check your email and get the username and password that were generated, then return to and log into the VIP page and complete the Application Workbox. Official transcripts from all post-secondary institutions you have attended. International students also need to submit satisfactory TOEFL scores. Copies of transcripts from all post-secondary institutions (unofficial copies are fine). Three letters of recommendation from individuals competent to comment on your promise as a graduate student (use the document provided at the following link: Request for Information: Letters of Rec). A Statement of Purpose that is a 1-2 page essay describing your reasons for considering graduate study, your goals after completion of the graduate degree, and your specific area of interest. GRE test scores (our institution code is 4861 and the department number is 0504). If you have completed the 6 steps above your application will be complete! All application materials are available on-line. However, if you need to have paper application forms, contact the Departmental Office directly and the materials will be mailed to you. The M.S. program in mathematical sciences has four areas of concentration: pure mathematics, applied mathematics, applied statistics, and teaching mathematics. Admission to the master's program in mathematical sciences requires, in addition to the Graduate College admission requirements, that a student has completed 18 upper-division credits in the mathematical sciences. The Ph.D. program in mathematical sciences has four areas of concentration: applied mathematics, computational mathematics, pure mathematics, and statistics. In addition to departmental requirements, applicants must satisfy the admission requirements of the Graduate College. Requirements for admission to the doctoral program requires applicants to have a minimum GPA of 3.00 for all undergraduate work or a minimum 3.25 GPA for the last two years of undergraduate work. Applicants seeking direct admission to the doctoral program without a previously earned M.S. degree must have a minimum GPA of 3.00 for all undergraduate work or an overall 3.25 GPA for the last two years of mathematics undergraduate work. Applicants with a master's degree must have an overall 3.00 GPA in their master's program and at least 15 credit hours of graduate-level course work in mathematical sciences with a grade of B or better. Applicants must also submit official scores from the GRE General Test; successful applicants to the program are expected to have GRE scores among the upper 50th percentile of examinees taking the general GRE test. Prospective graduate students must satisfy the graduate admission requirements for the relevant degree. Application forms and fees, official transcripts, test results, and assistantship applications are all submitted directly to the Graduate College (address below). Informal copies of the application, transcripts, test results, three letters of recommendation, and a cover letter are to be submitted directly to the department office. Both the General and Advanced Graduate Record Examination (GRE) are required. International students should check with the Graduate College for current deadlines and procedures (p. 21 - 25). International students are required by the Graduate College to complete the TOEFL exam with a score of 550 or higher, or to show comparable evidence of competence in English. A minimum overall undergraduate grade point average of 3.00. Satisfactory scores on the GRE at the general level. This requirement may be waived in the case of candidates with exceptional professional experience. Three letters of recommendation from individuals competent to comment on the applicant's promise as a graduate student. A letter of application stating the student's interests and goals. Submission of an application to the Graduate College, as well as official transcripts of all college-level course work.